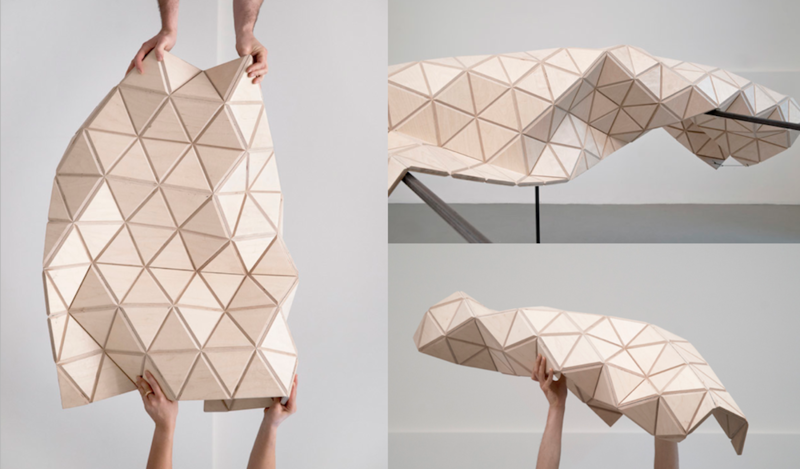 Created by four young Italian designers from Milan, Woodskin is the wooden sheet that flexes like a textile. This new composite and elegant material works like an organic architectural tissue that can be modeled and bent to create complex shapes. Woodskin is composed by a high performance mesh sandwiched between two wooden layers that have been cut in a geometrical pattern of thin tiles. Whilst changing its shape, this strong and versatile product absorbs the structural tension stress without being damaged in the process. Woodskin can work as a movable and interactive surface, suspended ceilings, or as a bridge element between different shapes, and it can also be used for both interior and outdoor designs. “With this material designers will be able to realize unconventional structures, hard to achieve with the traditional building techniques” Say Giulio Masotti, Stefano Baruffaldi, Gianluca Lopresti and Susanna Todeschini, the eclectic minds behind this project. “Indeed it is possible to create partially self-sustaining volumes and geometries without the need for complex and expensive fixing systems. WoodSkin is not just a simpple material, but a way to re-think building systems, giving specific and effectives answers to formal, aesthetic and structural needs”. The high-technology production process allows to customize as much as possible the product. Indeed it is possible to create different sections that allow this macrostructure to be bent to the desired shape, intervene on the angle of excavation modifying the bending angle and the density of the pattern, choose from different finishings and types of wood or even work with materials other than wood.